What I haven’t shared with you yet is that Mewsley has been poorly. The day before we got back from honeymoon, she went blind.. We came down from the joy of the honeymoon pretty fast, I can tell you. Thug coped really well with being blind, Mewsley was another story – she’s much older than Thug was when he went blind. She was distraught and depressed – heartbreaking. But don’t fret – there is a happy outcome. Vets appointments, diagnosis of retinal detachment due to high blood pressure, drugs, cuddles, prayers and a mighty large bill and I’m happy to say her retinas have BOTH reattached and she can see again 😀 She’s still too skinny and a little fragile but very well in herself. We’re mightily relived. 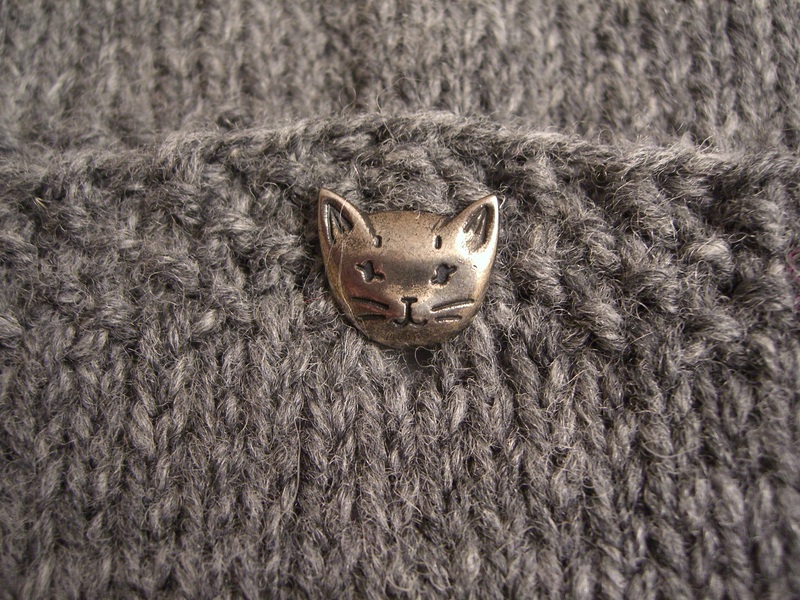 So what do you knit a recovering, vintage cat?? 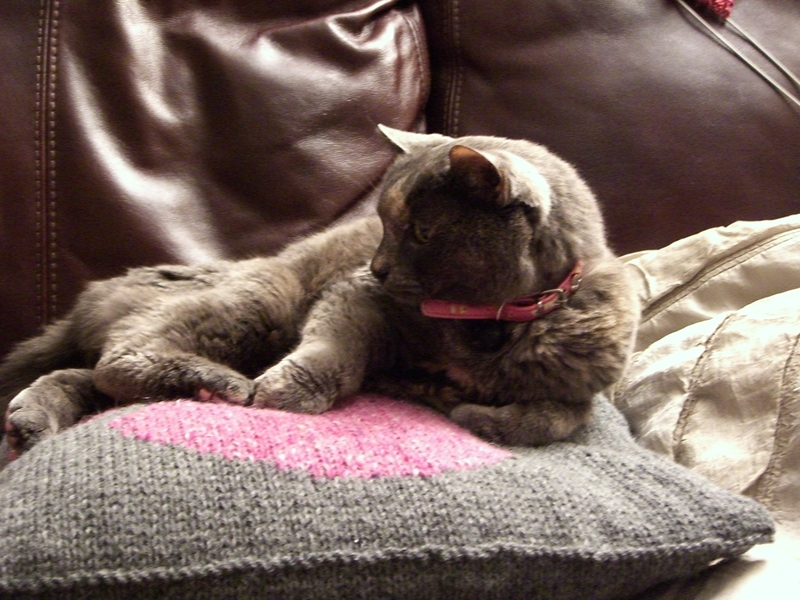 Well, she loves to curl up on the sofa on a cushion with us in the evenings and frankly, my old knitted cushions were well past their best. I’ve made her the one on the left – the giant paw print. It’s supposed to be a tiger paw print but all I saw was Mewsley’s little pink paddy paws – awww. 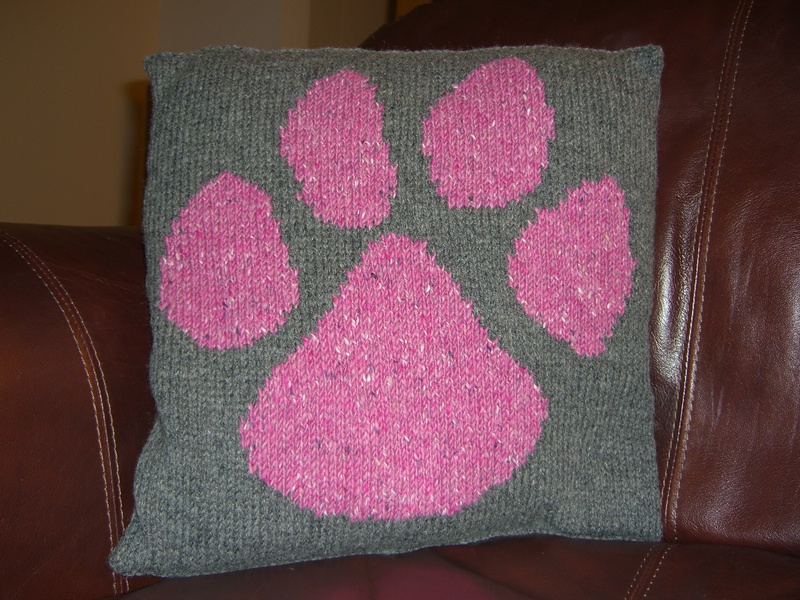 I chose Mewsley-fur grey for the main colour and pink for the paw. You want to see it don’t you?? The cushion is in aran weight so it’s nice and quick. 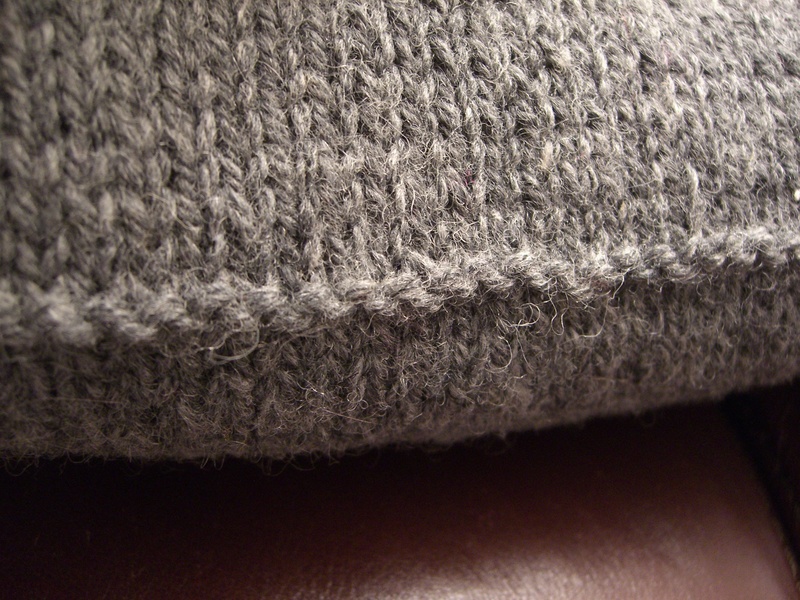 The back is two slightly overlapping flaps with buttons to hold it shut and the whole thing is knit in one peice with a reverse stocking stitch row where you fold. Very neat and easy. So did Mewsley like it? 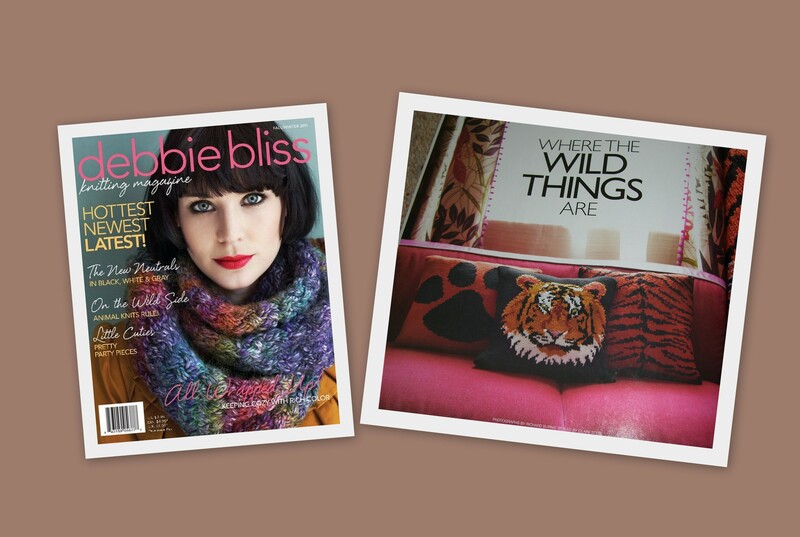 She is a cat and it’s cat-law to ignore anything special made or bought for you….. But my lovely Mewsley ignored that 🙂 She was on it the second I finished….you can see that from the pin tin and the trimmings in the photo!! 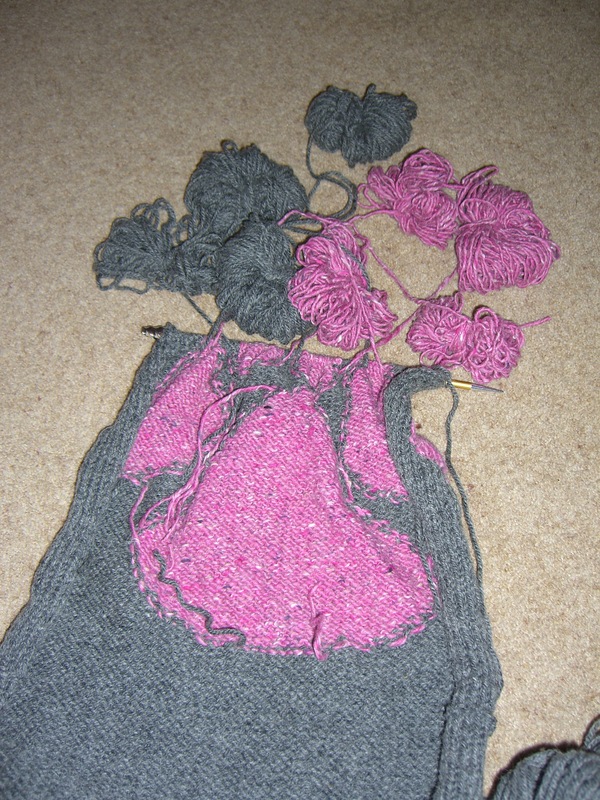 Difficulty: Medium – intarsia is always a bit tricky for me. So sorry to hear that Mewsley is ill (great great name for a cat). I love that she is pleased with her wonderful new cushion. I am NOT letting Florence see that cushion, or I know she’ll want one too! It looks great, and I’m so pleased that Mewsley is on the mend. You must have been so worried. That is great…and such a nice thing to do for Mewsley…. ..and she chose your cushion over the comforter!! She must be pleased with it!!! That is so sweet and I’m glad she’s doing better. Isn’t it wonderful to be able to make your animals happy? She is definitely looking happy in that last picture; happy and contented. Mewsley is so pretty. Wonderful that she has recovered so well and can enjoy her lovely warm comfortable cushion. ‘Paw’ Mewsley! 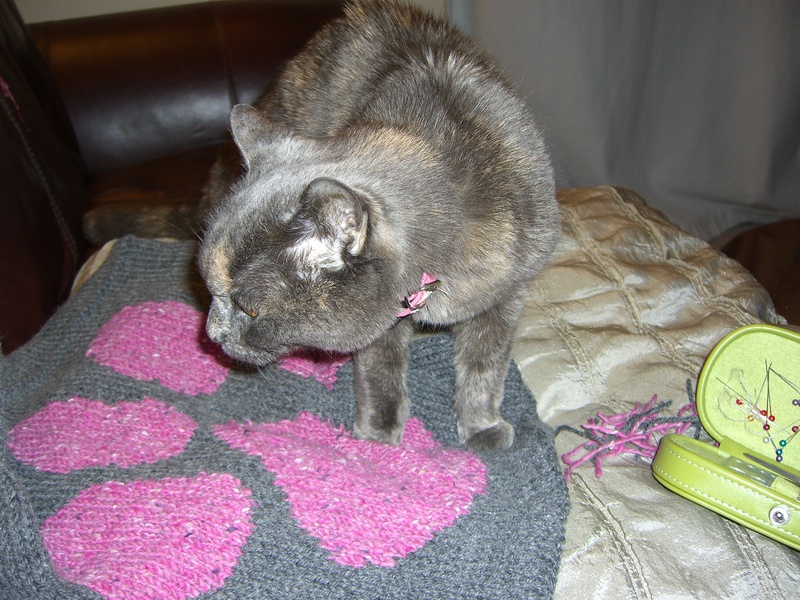 Glad to hear she can see again and is on the mend, the coushion is great just right for a special cat. and thanks for all the knit report it is good to know the details.